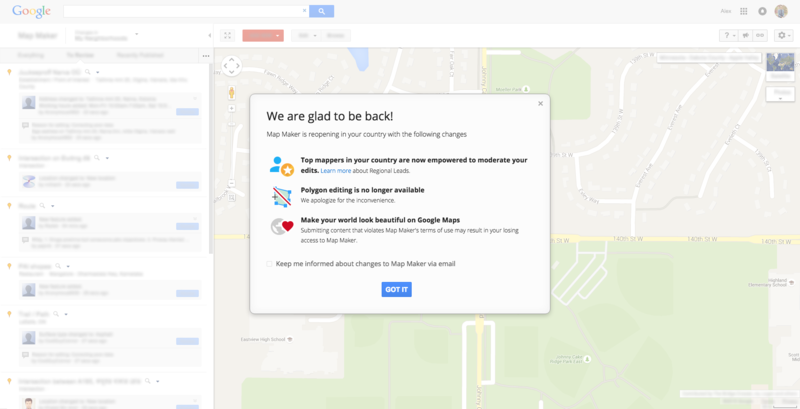 When navigating to Google Map Maker, users are greeted with a dialogue box that allows them to search for their country. Based on the selection, Map Maker will tell you if editing is enabled, and shows a few changes from how it worked previously. Within the app, users are able to add and edit businesses, roads, rivers, trails, and even directions. There is a huge community of people who love to keep the information on Google Maps up-to-date, and their primary tool for editing is once again open for business. The major difference in the new system is the presence of Regional Leaders. These individuals are chosen by Google to help review and moderate edits that are being done through Map Maker. To become a regional leader you need to apply, with the requirements of superior mapping skills and enthusiasm for the Map Maker community in your region. If you are a data junkie like I am, and believe you have what it takes to be a regional leader, you can apply using this form.